The status of emergency and disaster management (EDM) as an academic and professional discipline remains one of the field’s lingering, unresolved questions. A majority of the literature appears to support the claim that emergency management either is, or is in the process of becoming, a recognized academic and professional discipline. The claim’s key belief is that the field possesses a unique body of knowledge, an essential conceptual requirement for disciplinary status. This thesis examines the concept of professional/academic disciplines, as it relates to bodies of knowledge, and more specifically, the EDM body of knowledge. The technique of knowledge domain visualization (KDViz) using co-citation analysis is discussed. 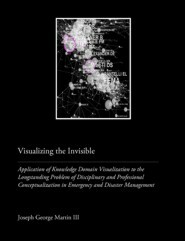 Analysis and visualization of the disaster literature is conducted using CiteSpace II, a KDViz software program, and a dataset of 2385 EDM articles, 1994-2011, obtained through the Web of Science bibliographic database. Results are presented and discussed within the context of both practical and theoretical concerns affecting not only EDM, but the entire field of disaster studies. Mr. Martin holds a B.A. in Psychology from Texas State University-San Marcos, and earned an M.A. in Emergency and Disaster Management from American Military University in 2013. He recently started doctoral studies at Capella University in the School of Public Service Leadership, specializing in Emergency Management and concentrating on Public Policy Management.